WHY SHOULD CARRY A BOOT KNIFE? 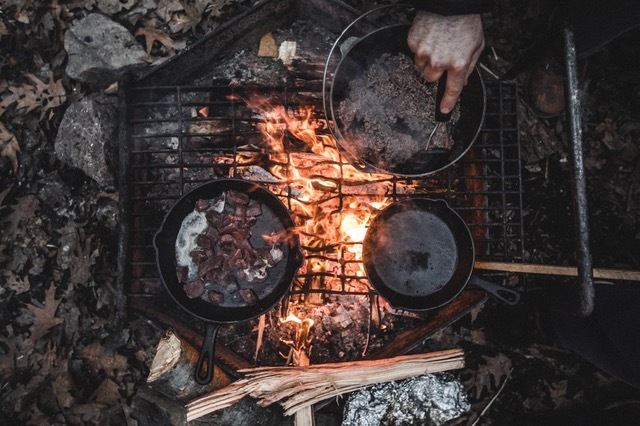 If you are adventurous and like to enjoy the hunting, camping, hiking, and fishing. Then you have to prepare yourself to face the challenging situations. ​A boot knife is an excellent survival partner to carry comfortably during your adventure. 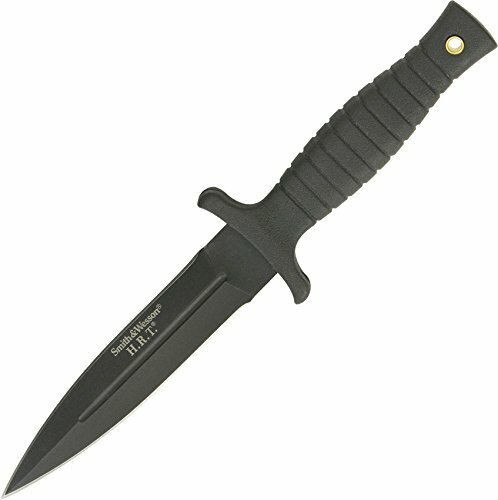 Are you curious about best boot knife? So you are at right place if you want to buy a boot knife take decision for the best one you can purchase easily. Plz Don't Miss. Safety measures for carrying the knife in the last of this article. 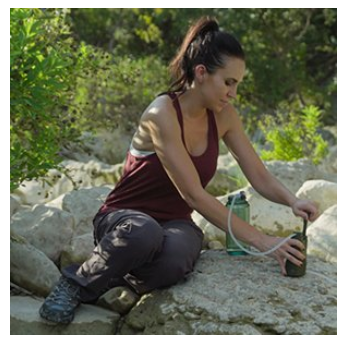 Perfect for camping, fishing, outdoor adventure and self-defense. Read ongoing reviews of some strong and good performance boot knives from some famous brands. You can slecet kife as per your requirements and needs. You can use a boot knife for domestic work, recreational activities and even for professional tasks. Smith & Wesson’s SWHRT9B Is a perfect substitute of performance and price. This knife is easy to carry in your boot with its little and weight and size. It can be easily carried in hiking boots, camping boots, regular boots and professional boots. However, it’s not very well in low cut boots. You can find the handle of the knife a tiny and thin but it does not mean that it will fail to provide a good hand grip owing to its rubber making. Its blade is made of high-quality carbon stainless steel. The blade edges are quite sharp. It covers with a safety leather sheath which makes it safer in keeping the knife from harming it. The strip joint with the sheath is easy to unhook with your one hand, however, pulling out the boot knife while the strap is getting out of the way all with one hand can take some training and practice. Majority of the customers have seen an excellent performance during use it as a throwing knife. It is also a great tool or weapon for self-defense. Basically, it is a double-edged dagger style blade greater than 4 inches one important note here to need to know for the customers that it may have to face the legal objections in most of the places. The most important thing for the customers is that please don’t forget to check the laws in the place you want to keep it. Best Use: Great for self-defense. Description: The Steel Kobun Tanto boot knife is soldier knife which is named on Japanese word, ‘kobun’, which means ‘soldier.’ The knife is made of a high-quality Japanese AUS 8A stainless steel. This is a dagger style knife. The point of the blade is boost by its thickness which runs ultimately to its tip. Kobun is made in medium length which makes it stylish and flexible. Its textured kraton handle and medium size makes it comfortable to holding it and use. Overall it’s a fantastic lightweight weapon to get at a suitable price for self defense. Been experiences where the sheath has uncover from a belt when the knife is pulled out. But no need to get tense because it won’t type of any problem if you need to carry the knife in your boot. 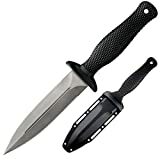 Best Use: This is Lightweight knife which will fit easily in your boot for outdoor activities including woodwork, hunting, camping, swimming, etc. Description: The Gerber Warrant Knife arrives from Gerber, a well known maker of tools for particular activities. The Warrant is a quite sharp knife having a lengthy blade made of a high quality stainless steel 7Cr17MoV. The warrant knife is slimmer as compare to the other knives available in the market. The tip of this knife is designed as a Tanto style point. It is entirely tang therefore its very strong and long lasting. There is not only a knife but it comes with a digital camo sheath with a leg strap and belt loop. The sheath is made in shiny style and has a solid clip to get attached vertically and horizontally. An elastic is also comes to tie up around the knife. The knife is very lightweight so it is simple to carry with you without any trouble. May be you find the sheath a little bit difficult to hide but no need to be confused you can replace it with some other goof if you want to strap it with your boot. Besides that may be it is not the better option for a survival knife or for your safety. It is only useful in other activities like cutting fruits, camping, woodwork, etc. It’s even lightweight enough to keep while swimming. You can use it to cut the bushes and ropes. The aluminum made handle may be a professional or a con for you depending on its planned use. It will not melt like rubber handles and will be useable even if you work near heat or chemical sources. On the other side if you get sweaty you can feel that handle gets sticky. 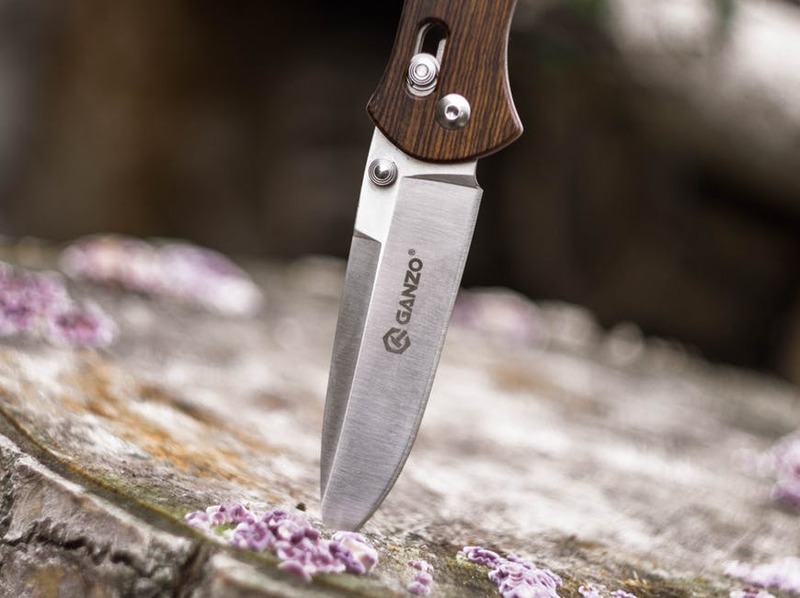 Finally an awesome lightweight knife you will choose for several purposes during camping. Specific Features: dual-edged, fixed blade, spear point, 1050 carbon steel, black finish, contoured handle, thumb indents, lanyard hole, nylon zytel sheath, one-piece. Description: The AG Russel Sting Is a machine from one block of steel in one piece and therefore it’s very strong and long lasting. The both edges of the blade has a spear point and sharp like a dagger. The Knife holds its edge finely and is strong at the same time. The knife is made by forged high quality carbon steel 1050. It’s also convenient to sharpen for a durable sharpness. The handle of knife is curved and has a thumb signs for a strong grip. The handle will feel you small thing in your hands because it has no coating but it will gives you a good grip. The blade of the knife is awesome no doubt because the blade is coated with a black non reflective and non corrosive powder which helps to deal the knife in heavy duty activities. There is also another unique feature in the knife if you want to carry the knife in your neck then there is a big hole in the handle to make it possible. A custom designed style sheath is also comes with this knife to attached it to your boot, backpack or belt. Overall it’s a stylish and reliable knife at affordable price. Best Use: Suitable for outdoor activities like woodwork, hiking, etc. and a good one to collect if you have a hobby to collect the knives. Description: The Becker Necker from Ka Bar is made by Cro Van Steel 1095 which holds its edge effectively. It is strong and long lasting. The length and shape of the blade gives you the opportunity to keep it easily for daily domestic and outdoor activities and also during adventurous activities like hiking, camping and may more. If we are talking about the blade quality of this knife then you must be relax to know that the blade of this knife is flat. You can buy a compatible metal clip to attach it to your belt and boot. On the other hand if you feel that the handle is not comfortable for your hands then you can buy a micarta handle and wrap it with paracord to use it comfortably. Even you can also make a handle from canvas and resin. In fact this knife is a great tool for wood work. 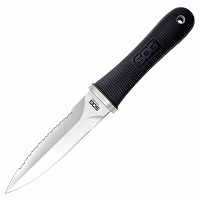 Description: The Counter Tac holds its edge better than other knives its from cold steel and is made of a hard AUS 8A Steel. It is also long lasting and hard. Its design make it perfect knife for sudden use and the good grip on its handle allows you to cutting and slicing anything immediately. It is a two edges knife in a dagger shape one is beveled and other is concave. The spear point of the knife is very sharp and may give a great stabbing. The blade of the knife is lightweight as you can easily carry it with yourself . The blade of the knife is in hollow ground shape. If we are talking about its handle than the kraton handle of this knife gives you the perfect and strong grip. The Safety sheath saves the knife in the fine way and makes the ejection of the knife easy and smooth during its need. It’s a great tool for stabbing, small in size, hence it’s a handy weapon to keep for self defense. Best Use: It is best survival knife for self-defense. Description: The Schrade SCHF21 Extreme survival knife as seems from its name is an extremely strong dagger style having double edged knife can be used as a tactical knife. The spear point considered its strong point and this point is designed for immediate cutting work, thrusting and also for slicing. Though it’s not meant that only cutting is a primary function of this knife. If you are curios about its manufacturing material then must read ongoing review. Its made with a highest quality carbon steel the SEA 1070. This knife is a great competitor to beat other knives available in market. The sharp pointed tip of this knife is powerful to slice. The great penetration of this knife makes it perfect weapon for self defense and also for hunting. It comes with a glass filled sheath of nylon that gives you the facility to attach it with your boot, belt and pocket. Simply press its handle and pull it out from the sheath easily. The sheath of the knife though is not durable and may be awkward to carry hidden in the boot. This Gerber Boot Knife is absolutely a stunning blade and sheath, and it is 3.25 inches long and 7 inches in length. It has a satin finished stainless steel blade with a spear point, and the handle materials are a black polymer. The sheath is brown leather with a belt loop. This is the most handsome of all the Gerber Boot Knife collection. It is sleek and made for long life and quality and yes it is pricey, but it is worth it every penny. This knife has rave reviews, and people are loyal to it because it is high quality. If you want a Gerber Boot Knife you are serious about, this is the one to get. How To Choose The Right Boot Knife This Gerber Boot Knife has a double-edge blade and non-reflective black blade coating. Its sheath has an adjustable withdraw tension, and the blade style is a spear. The handle material is glass filled nylon with soft grip inserts. The blade length is 3.4 inches, and the blade is made of stainless steel. The total length is 7.28 inches, and it is a fixed blade. The customer reviews on this blade were excellent rating it four and a half to five stars. However some people were dissatisfied with the sharpness of the blade upon arrival, but for the most part, people raved about how this is a great knife for everyday use. This Gerber Boot knife has a 3.4 in. Blade and it is 7.5 in overall length and weighs 3.3 oz. It has a TacHide handle for a secured grip in all situations. It is black and has adjustable sheath retention. This Gerber boot knife gets great reviews even for the price because it is a quality made the blade. 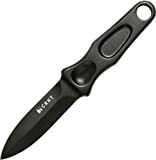 Most people who bought this Gerber Boot Knife said they loved it for everyday uses and enjoyed that it clipped on for a great carrying knife compared to others which did not perform so well. The ratings on this Gerber foot knife range between four and five stars. There was one enthusiastic reviewer who is active law enforcement and he gave it rave reviews as an excellent knife for the boot or for the vest. As written in our above reviews the most important thing to understand the laws of the state or region where you want to purchase and use this knife either its legal or not. If you purchase a knife in the restricted region you will find yourself in a shameless situation due to legal issues. Therefore, you have to do a deep research and read the laws carefully about the weapons. Actually these are considered illegal at many places because it’s a double edged dagger style knife with sharp point blades. When you are sure about the laws you can choose knife regarding your requirements and need. If you are fond of hunting and looking for knives suitable for these types of activities then purchase double edged knives like Schrade SCHF21 and the Counter tac. 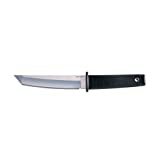 Look for a knife with highest quality steel blades Cold Steel, Gerber, Smith & Wesson, and Schrade these are some brands that are awesome in this category . If you are confused about the law regarding boot knife that is it legal or not? A boot knife is considered a hidden weapon and that’s why maybe it’s illegal or have to follow the strong laws in most areas. Actually, the main issue is many states have objections on the length of the blade. The style of boot knife blades like dual-edged. Be careful before travel with a boot knife in the law restriction places. If you decide to travel by air, then don’t forget to cover your boot knife in the check-in luggage. IT’S ALL IN THE STEEL! If you are not sure about the quality of boot knife, then make sure it the quality of the steel makes your boot knife a high-quality knife. Forged Japanese steel is a great option. The metal of the boot knife has to be strong enough like stainless steel so that the blade grip its edge and on the other hand it has to be hard enough to suffer bending and lateral forces during its use like powerful carbon steels. The quality steel must be both hard and tough. The next table shows some steels quality that suitable for quality knife blades. You can find a blade length of 3 to 5 inches if you wish to take the ideal length for a boot knife. 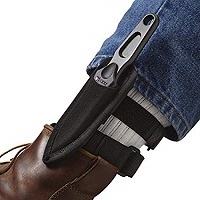 The given length will make it easy for you to hide your knife in your boot and will be purposeful for self-defense and other domestic and outdoor activities. A shallow belly enhances the tip of the blade for stabbing. On the other side, blades designed for slashing belly have a deep belly. The tang is the part of the knife where the handle and blade are attached to each other. The weakest point of the knife where the handle joins the blade. The construction of tang is considered to be an important thing for the boot knife. A full tang is where the blade of knife covers the complete width and length of the handle. A hidden tang comes after where the knife blade covers the entire length of the handle, but it is smaller than full tang. The partial tang is the weakest construction where the blade is both tiny and slim than the handle. The partial tang does not make a better boot knife. The material and the shape of the handle are the important things. The important thing is the handle should be comfortable. It must be made of a slip resistant material that can give a good and soft grip while hard tough at the same time. It would feel comfortable during concealed if it should not be too rough. When you would like to put the boot knife in your boot, it’s quite near to your skin. Your safety should be the first priority you should keep in mind. It is essential that the blade of the knife is cover with a sheath that will be strong enough not to let the knife harm you. Another important thing is to look for a well-made and easy to operate strap. That facilitates easy ejection of the knife from the sheath when the knife need arises. You will also like these posts……. How long is SWHRT9B knife… Just wondering. overall size is 9 inches.The blade is just over 4 and 3/4 inches. What is the main use of SWHRT9B use?